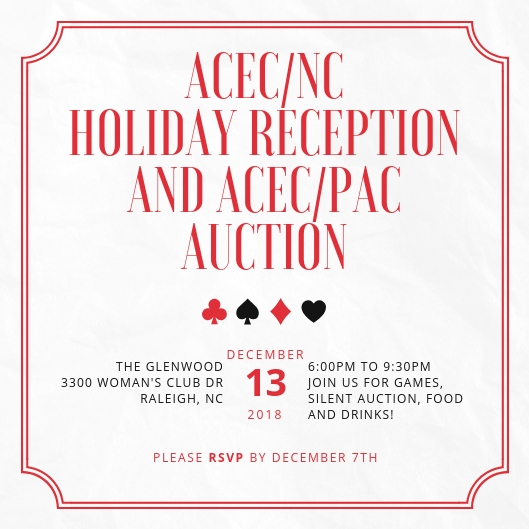 Join us for the ACEC/NC Holiday Reception and ACEC/PAC Auction! All guests will receive "funny money" that can be played for the duration or make an ACEC/PAC donation to purchase more chips. All proceeds from chip purchases and the silent auction go to ACEC/PAC (our National PAC). ACEC/PAC - is the engineering industry's primary tool for political engagement at the national level. Supported by engineering professionals from across the country who work for member firms, the sole purpose of ACEC/PAC is to elect candidates to the U.S. House of Representatives and U.S. Senate who support policies and legislation favorable to the engineering industry. table and tickets may be put directly into drawings for raffle items. Guests who choose to gamble can exchange their chips for raffle tickets at an exchange rate of 1 raffle ticket for every $1,000 in chips. Once all raffle tickets are collected, the winning tickets for the raffle items will be drawn at the end of the event. You must be present to win. employees of member firms are members. - No cash can be exchanged at the tables per NC law. 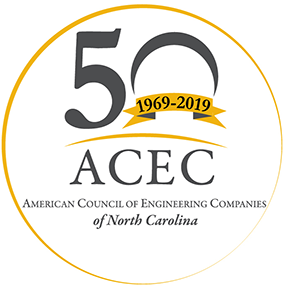 This event is for ACEC/NC members and guest only. There is no charge to attend. Please RSVP those attending so we have a headcount. Thank you.